If you manage social media accounts, the thought of missing important moments might send a shiver down your spine. There’s always a possibility that a rampant customer issue or a viral response to a post goes unnoticed—and being absent for a matter of minutes in the social world can feel like hours. But it’s difficult to always be locked in and see every message immediately. Even if you’re fully attentive, it’s not always obvious which messages require immediate attention. And the transparency with customer interactions is growing—nearly half (46%) of people say they have used social media to “call out” or complain about a business. We’d like to help calm your fears, which is why we’re introducing Message Spike Alerts. Message Spike Alerts (available on Advanced plans) are notifications that detect an influx of incoming messages, making you immediately aware of an increase to mentions or keywords related to your brand or industry. With Spike Alerts, you’ll maintain a healthy work/life balance during non-peak hours (by not constantly checking your inbox), recognize when there’s urgent messages to address and be prepared to take action when there are incoming waves of high volume. 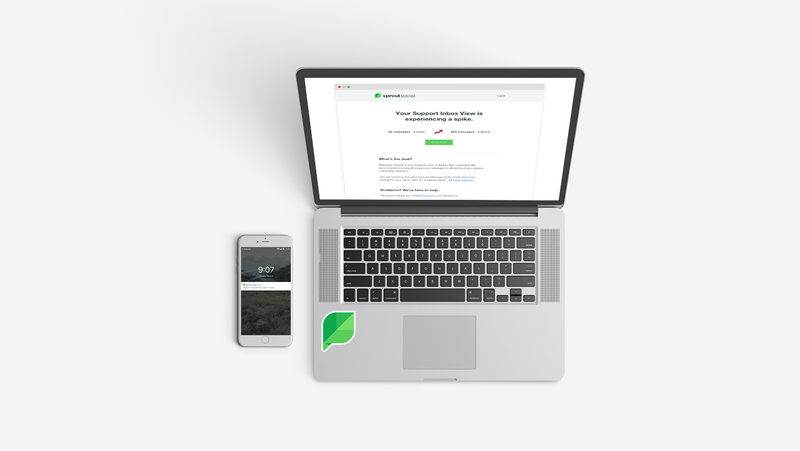 Integrated with Sprout’s Inbox Views, set up Spike Alerts to get notified when your message volume is higher than usual. An alert will trigger an email or mobile push notification that allows you to go straight to your Inbox to check out what’s going on. No matter what you’re currently doing, you’ll know where to focus your attention—whether you’re about to receive a wave of viral brand mentions, looking to stay on top of trending information or need to know about negative publicity so that you can react accordingly. For example, a restaurant chain might receive serious complaints and need to quickly acknowledge the situation. They can set up Inbox Views with specific keywords such as “food poisoning” and their company name. Upon receiving a Spike Alert, they can promptly respond or forward the email to another team member that can handle the situation before it gets out of control. To get started with Spike Alerts, you’ll need to set up an Inbox View to specify which types of messages you’d like to get alerts for. If certain profiles, message types or triggered keywords are more important—such as only Facebook Private Messages or profiles specific to Customer Support— you’ll get spike alerts for only those messages. Alerts are only beneficial when they signal an event that’s significant to you. That’s why we’ve taken a data-driven approach to detecting anomalies and are giving you the flexibility to control how often you get alerted. Spike Alerts continually analyzes your average hourly message volume to calculate when you’ll receive alerts relative to that hour’s expected volume. Each Inbox View can be configured for it’s alert sensitivity level from your Inbox Settings screen, where you can make alerts more or less sensitive depending on how many you want to receive. Within Sprout’s Android and iOS apps you can also set up push notifications for Spike Alerts, giving you extra security if you’re not always checking your email. You may even start to notice trends with the messages that elicit higher volume. Once you start to observe common questions from your customers, you can incorporate some of Sprout’s response management tools like Saved Replies and Automated Chatbots to help you respond quickly and on-brand—improving your response times and keeping everyone happy. We hope that Spike Alerts helps you stay on top of important social moments. How do you plan to use Spike Alerts? Let us know in the comments below or hit us up @SproutSocial on Twitter.